Get all your news, sans cable package, right on your Apple TV. 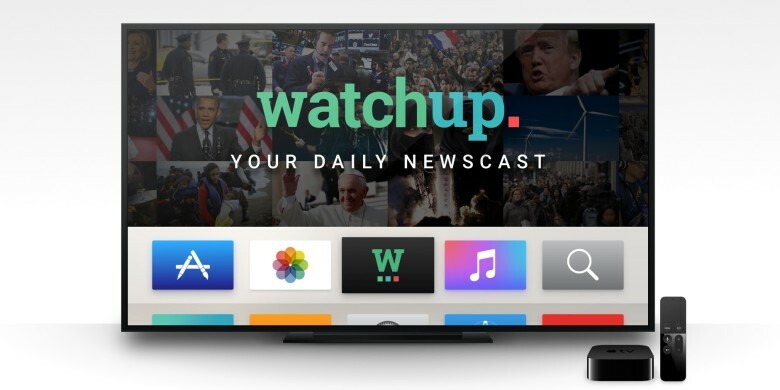 Watchup wants to replace standard TV news with a personalized multi-channel news aggregator that runs right on your Apple TV. The developer promises that you’ll get a customized, on-demand news app right on your big TV, letting you lean back and learn what’s happening in the world. All that without a cable subscription; sounds pretty great to me. Launching the app gets you a choice of nine topics: Business, Entertainment, Ideas, Sports, Technology, Politics, World, Gaming and Humor. You’ll pick the ones that interest you most, like you do via Apple Music or News on your iPad, and then move on to choose any number of local news outlets that you want to watch. There are a ton of these, including news from Las Vegas, Denver, Greensboro, Grand Rapids, and the like (though don’t have one for Anchorage). Once you’ve indicated your preferences, you’ll see a grid, Apple TV-style, with both a curated list of things you’ll probably want to watch and specific channels from the local newscasts you chose in the second step. Further below that, you’ll see the topics you chose, too, like Arts, Gaming, World News, and so on. These aren’t fly-by-night news sources, either. Watchup says it has partnerships with Bloomberg, PBS, CNN, CBS Interactive, Financial Times, Fox News, Fusion, Sky News, The Wall Street Journal, Washington Post and more. The team also just announced a new direct partnership with Turner Broadcasting, which lets them offer CNN content as well. You’re not going to get this good a news experience on your cable plan. Plus, Watchup is easy to use, letting you click through to specific videos or just let channels run clip after clip. It leverages the Apple TV interface well and works great with the Siri Remote. I’m pretty impressed with both the breadth of news sources as well as with the easily understood interface. Give it a try and let us know what you think. You can also get Watchup for free on iOS, Xbox 360, Wii, Amazon and Google Play. To grab it on the Apple TV, head into the Apple TV App Store and search for Watchup.